LENGTH X WIDTH X HEIGHT: 182.2 x 73.3 x 57.1 in. CARGO CAPACITY: 16.7 cu. ft.
BOTTOM LINE: The Honda Accord is a good solid mid-size sedan with good ride quality. The mid-size segment is one of the most competitive in America, with a slew of vehicles from a slew of manufacturers, all seeking a piece of the pie. Most of these sedans are pretty good, and a few are better than good. The Honda Accord is one of the latter. Almost from the day I began these ramblings I remember being impressed with Honda engines, especially the smaller ones. I think this harkens back to Honda’s early history as a motorcycle manufacturer. 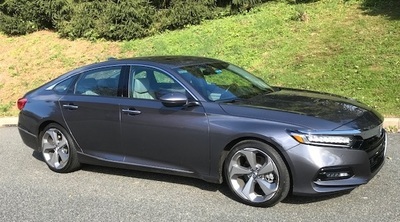 While the Accord has played with larger engines in the past, notably a 3.0-liter V6, our tester was powered by a turbocharged 2.0-liter inline four that proved to be perfectly adequate. The engine develops 252 horsepower, which is more than enough for a car that weighs 3,377 pounds. We enjoyed brisk acceleration. We have a small hill that we travel regularly. Essentially we turn left at a stop light and floor the accelerator until we hit the speed limit, then back down. The Accord reached terminal velocity a lot quicker than many other cars, which ask for a floored accelerator to the top. As with most four-cylinder engines, there is some engine noise on hard acceleration, but the engine is normally quiet, leading to an overall quiet ride. Surrounding the engine is a new, more rigid, lightweight and tightly sealed body and all-new chassis design. Honda claims it’s the Accord’s most radical redesign. Ride quality's good, although it doesn’t deal with rougher roads very well. Handling is good, as attested to by the car’s response over some interesting winding roads we found. The driver faces a clear instrument panel and a heads up display that highlights economical driving. The instrument panel surround glows green for economical driving, white otherwise. The information screen in the center screen has 12 different options to scroll through from tachometer to audio to warnings. It proved very useful. In addition, it has speed limit notifications, as well as on the HUD. The shifter is unique to Honda vehicles, and we have used it in Acuras as well. There is a Park pushbutton, a Reverse pull lever, neutral and drive push buttons. All light with different colors so you have a tactile feel for the different gears as well as a color sense. Interior storage consists of a huge cubby at the base of the center stack that includes a charge pad. I almost lost the keys when I put them in there. This cubby also has 12-volt and USB outlets. There is a large two-level center console/arm rest that is useful. In the center of the dash is a clear audio/navigation screen. The audio system offers excellent sound quality. The heating system is very efficient, almost too efficient. I got in the car on a cold day, heated up the seats and jacked up the temperature. Within a few minutes I was ratcheting everything down. Front seats have good side support in the kidney and thigh areas. Rear legroom is very good, but I hit my head on the roof the first time I entered. The rear seats are heated as well as the fronts. Cargo capacity is a good size. The rear seat back releases are in the trunk, where they can be used when you suddenly notice that you have more stuff than the standard trunk can handle. Overall, the Honda Accord is a nice package that should help continue its streak as America’s best-selling car over the past 41 years, and ikea it on track for its fifth consecutive year as America’s number one mid-size car.